Is The Marie Kondo Method For You? | Enuff with the Stuff – Sort Stow and Let It Go! 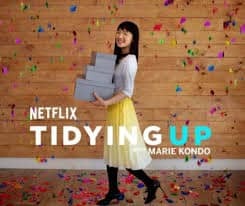 Have you caught any of the shows on Netflix of the new series called Tidying Up with Marie Kondo? It has been hard to avoid hearing about it and everyone is either thrilled to have learned how to finally “tidy up” or hate her because she can make the daunting task of purging seem overly simple. I admit I have a love/hate feeling about her. I really love that she is providing a method that resonates with so many people who may have felt stuck for far too long. She is exposing the world to the concept of professional organizers, so that has been terrific for our industry as a whole. But, I also worry that folks for whom this method doesn’t resonate will be afraid to reach out to other organizers, which would be a shame because there are thousands of organizers who belong to The National Association of Productivity and Organizing Professionals(NAPO) and have their own unique ways of working with clients. NAPO members follow a code of ethics which makes us unique from other organizers who hang a shingle out and call themselves organizers. Just because someone is good at organizing themselves, does not mean they will be able to help other people get organized. The mission of NAPO organizers is to transfer skills, not come in and do everything for the client without their involvement. You can’t possibly transfer skills if the homeowner isn’t involved in the process. We are there every step of the way with the homeowner helping them learn about why they are holding onto things that may not be serving them and then work through the letting go process. Many of us take extensive training to learn special skills in order to help our clients work towards success, however that may look for them. Some clients don’t want their home to look like a magazine cover while some may just want more functionality rather than a pretty space. I do agree with Marie Kondo that having less stuff is a good thing because it can make a big difference in your life and it sure does make staying organized a lot easier. I usually ask my clients to only keep what they love, need, or have room for. That covers a bit more than just keeping what sparks joy since I know that most people need a plunger but it certainly doesn’t spark joy for anyone! Have you been trying the Marie Kondo method? Were you able to accomplish your organizing goal with her method? Share, over on my FB book page, your experience with her method.